The purpose of this application note is to provide recipes and examples for how to render global illumination effects with Pixar's RenderMan. Among the possible effects are super-soft shadows from ambient occlusion, image-based environment illumination (including high dynamic range images, or HDRI), color bleeding, and general global illumination. We also show how to "bake" ambient occlusion and indirect illumination for reuse in an animation. An approximation of the very soft contact shadows that appear on an overcast day can be found by computing how large a fraction of the hemisphere above each point is covered by other objects. This is referred to as ambient occlusion, geometric occlusion, coverage, or obscurance. This gather loop shoots rays in random directions on the hemisphere; the number of rays is specified by the "samples" parameter. The rays are distributed according to a cosine distribution, i.e. more rays are shot in the directions near the zenith (specified by the normalized surface normal N) than in directions near the horizon. For each ray hit, the variable 'hits' is incremented by one. After the gather loop, occlusion is computed as the number of hits divided by the number of samples. "samples" is a quality-knob: more samples give less noise but take longer. Any value of "samples" can be used, but for the cosine distribution "samples" values of 4 times a square number (i.e. 4, 16, 36, 64, 100, 144, 196, 256...) are particularly cost-efficient. This gather loop can be put in a surface shader or in a light shader. 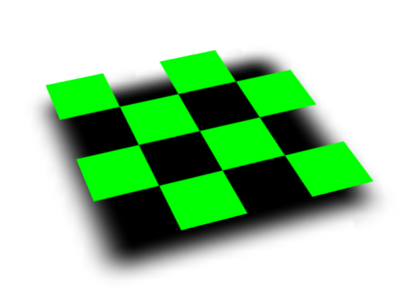 The following is an example of a surface shader that computes the occlusion at the shading point. The color is bright if there is little occlusion and dark if there is much occlusion. 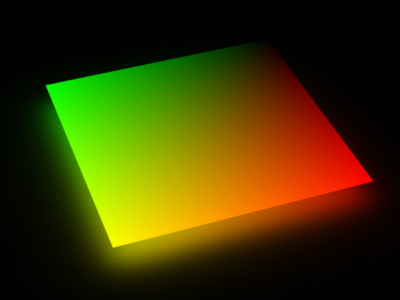 And here is a light source shader that does the same; this color is then added in the diffuse loop of surface shaders. The following RIB file contains a matte sphere, box, and ground plane. The objects are illuminated by the 'occlusionlight1' light, which adds occlusion-dependent color to the diffuse loop in the matte shader. The resulting image (below, left) is very noisy since "samples" was set to only 16. This means that the occlusion at each point was estimated with only 16 rays. In the image on the right, "samples" was set to 256. As one would expect, the noise is significantly reduced. Computing occlusion using gather at every shading point is very time-consuming. But, since occlusion varies slowly at locations far from other objects, it is often sufficient to do gathers only at the shading points that are at corners of micropolygon grids and just interpolate the occlusion at other shading points. 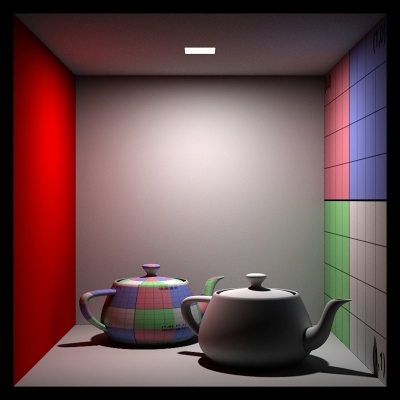 In a typical scene relatively few parts of the scene are so close to other objects that occlusion has to be computed at every single shading point. We exploit this fact with the occlusion() function. The occlusion function only does gathers where it has to; at most locations it can just interpolate occlusion from other gathers nearby. Similar to the gather loops discussed above, "samples" is a quality-knob: more samples give less noise but take longer. Once again, any value of "samples" can be used, but values of 4 times a square number (ie. 4, 16, 36, 64, 100, 144, 196, 256...) are particularly cost-efficient. If the RIB file in section 2.1 is changed to use occlusionlight2 instead of occlusionlight1, the following image will be computed. 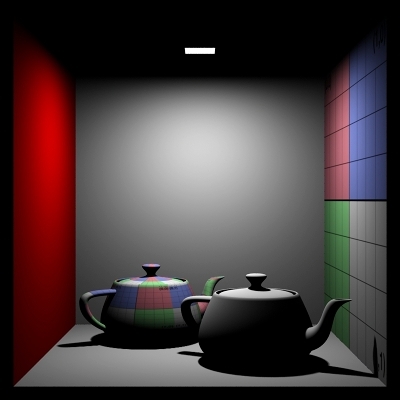 Using occlusionlight2 (with 256 samples and maxvariation 0.05) instead of occlusionlight1 makes rendering this scene approximately 20 times faster. The occlusion function uses the parameter "maxvariation" as a time/quality knob. "maxvariation" specifies how much the interpolated occlusion values are allowed to deviate from the true occlusion. PRMan uses this value to determine where the occlusion can be interpolated and where it must be computed (using ray tracing). If "maxvariation" is 0, the occlusion is computed at every shading point. If "maxvariation" is very high (like 1), occlusion is only computed at the corners of micropolygon grids and interpolated everywhere else. With intermediate values for "maxvariation", the occlusion is computed sparsely where it varies slowly and consistently, and computed densely where it changes rapidly. For high-quality final rendering, "maxvariation" values in the 0.01 to 0.02 range are typical; for quick preview renderings values of 0.05 or even 0.1 can be used. The occlusion interpolation can only work if it gets reliable occlusion values at those positions where it deems it necessary to shoot rays. If the number of rays is too low, there will be too much noise in the ray-traced occlusion results, and any attempt at interpolating between those noisy values is bound to fail. As a rule of thumb, 1/"samples" should be smaller than "maxvariation". In addition, the optional "hitsides" parameter should be left at its default value - "both" - for occlusion interpolation to work. Note that, as of PRMan 16.0, when "maxvariation" is larger than 0, PRMan will print a warning if the number of samples is too low for the given maxvariation or if hitsides isn't "both". In earlier versions of PRMan the occlusion time/quality was determined by a parameter called "maxerror"; this parameter is still used if "maxvariation" is not specified (or is negative). If neither "maxvariation" nor "maxerror" is given as a parameter to the occlusion() function, the value of the maxerror attribute will be used (the default value is 0.5). maxerror is a multiplier on the harmonic mean distance of the rays that were shot to estimate the occlusion at a point - a fairly unintuitive and non-linear control. The "maxvariation" parameter was introduced in PRMan 12.5.1. "maxvariation" is a better error metric than "maxerror" - the same quality can be obtained with fewer occlusion calculations, delivering faster results. Furthermore, the control is more intuitive. Another optimization that occlusion() uses is adaptive sampling of the hemisphere. This is turned on by default if the number of samples is at least 64. If you want to turn it off, set the optional parameter "adaptive" to 0. If "adaptive" is on and the optional parameter "minsamples" is supplied the hemisphere will be adaptively sampled with at least "minsamples"; if "minsamples" is not supplied, "samples"/4 will be used. Setting minsamples to less than one quarter of "samples" is not recommended. Adaptive sampling gives good speedups for most scenes, with the exception of scenes that contain a lot of tiny objects. In the example above, the box was slightly above the ground plane. If it was exactly on the plane, or going through the plane, the occlusion right on the edge would be very jagged and aliased. One way to overcome this is to jitter the origins of the rays shot to sample the hemisphere. This is done with the optional "samplebase" parameter of occlusion(). A value of 0 means no jittering, a value of 1 means jittering over the size of a micropolygon. There are a few knobs to tweak for artistic choices for the ambient occlusion "look". The maxdist parameter determines at what distance an object can cause occlusion. Small values make the ambient occlusion a more local effect. The default value is 1e30. subset is a name of a subset of objects to consider for ray tracing. type is "transmission", "diffuse" or "specular". The default ray type in PRMan 17.0 is "transmission"; in 16.X versions of PRMan the default was "diffuse". hitmode determines how the opacity should be computed at ray hit points. The four possible values are "primitive" (use the object's Os vertex variable or Opacity), "cache" (look the color up in a point cloud or brick map), "shader" (run the surface shader), and "default" (let the hit object decide). (If "hitmode" is "default", the attribute "shade" "transmissionhitmode" at the hit surface can modify how the opacity should be computed. Possible attribute values are "primitive", "cache", and "shader". In "transmissionhitmode" "cache", the file name can be specified with Attribute "shade" "transmissionhitcache" "file:...", and the opacity channel name can be specified with Attribute "shade" "transmissionhitopacitychannel" "...". If the ray type is "diffuse" (as is the default in PRMan 16.5 and older), the "diffusehitmode" is used. If the surface is not opaque, the hit will count as less than a hit for occlusion purposes and a continuation ray will be shot. hitsides can be "front", "back", or "both". When a ray hits a one-sided surface (spedified with Sides 1), the hit is rejected if the side does not match "hitsides". The default is "both". distribution can be "cosine" or "uniform" (with "cosine" the default). falloffmode is used to choose between two types of distance falloff. Set to 0 (the default), the occlusion contribution of a ray hit has exponential falloff; set to 1, the occlusion contribution of a ray hit is computed as (1 - dist/maxdist)^falloff. falloff determines the occlusion falloff with distance. When the "falloffmode" parameter is set to 0 (its default), indicating exponential falloff, the occlusion() function uses the "falloff" parameter to determine the rate of falloff via exp(-falloff*dist). This can be used to model, for example, attenuation through a volume. When the "falloffmode" is set to 1 the occlusion contribution of a ray hit is computed as (1 - dist/maxdist)^falloff. In this case, "falloff" = 1 gives linear falloff. Note that the default value for "falloff" is 0, meaning no distance falloff regardless of the "falloffmode" setting. seed can be used to seed the random ray directions. The main use is that if seed is computed as a function of a Pref, then the sampling noise patterns will follow an object even when it moves. For example: float seed = abs(123 * Pref + 456 * Pref + 789 * Pref); (Less useful: if "seed" is a constant value then the ray directions from all points will be the same, leading to no noise but heavy aliasing.) If "seed" is set to -1 or not specified, the ray directions will depend on position and change when points move. The shader occsurf3 below shows an example of using the "maxdist" and "coneangle" parameters. The figure below shows nine variations of "maxdist" and "coneangle". bias can be used to override the ray tracing bias attribute. maxpixeldist can be used to override the attribute. For some looks, we want to illuminate the scene with light from the environment. 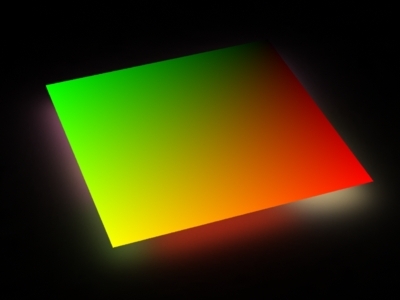 Most commonly, the light from the environment is determined from an environment map image; this technique is called image-based environment illumination, or simply image-based illumination. To compute image-based illumination we can either extend the gather loop or use more information from the occlusion function. There are two commonly used ways of doing the environment map look-ups: either compute the average ray direction for ray misses and use that direction to look up in a pre-blurred environment map, or do environment map look-ups for all ray misses. The examples in this section show both these variations. Common to all these techniques is that the images used can be high dynamic range images (HDRI). We can improve the efficiency of image-based illumination by using the occlusion() function. occlusion() computes the average unoccluded direction while it is computing the occlusion, and also interpolates the unoccluded directions. Because of the interpolation done in the occlusion function, this image is much faster to compute than the image shown in the previous section, at right. Again, the environment image needs to be blurred a lot. We can improve the accuracy of the image-based illumination with little extra cost by performing one environment map lookup for each ray miss (instead of averaging the ray miss directions and doing one environment map lookup at the end). In the example above this wouldn't make much difference, but if the environment texture had more variation there could be a big difference between the color seen in the average unoccluded direction and the average of the colors seen in the unoccluded directions. An example of a case where this would make a big difference is right under an object: the average direction may be right through the object while the visible parts of the environment form a "rim" around the object. When the occlusion() function is provided an environment map for image-based illumination, the environment map will automatically be used to importance sample the hemisphere: more rays will be shot in directions where the environment map is bright than in directions where it is dark. This significantly reduces the noise in the computed "environmentcolor", and makes it possible to reduce the number of samples. The meaning of the value returned by the occlusion() function changes when an environment map is used like this: instead of being the fraction of the hemisphere that is occluded by objects, it is the brightness-weighted fraction of the hemisphere that is occluded by objects. The only case where it makes sense to turn off the "brightnesswarp" parameter is if the environment map has nearly uniform brightness everywhere. In that case the importance sampling is a waste of time and gives no improvement in image quality. One slightly confusing effect for environment sampling (both brighness-warped and not) is that when the number of samples changes, not only does the noise change, but the sharpness of the illumination variation changes, too. This is because the filter size of the environment map lookups is determined by the number of samples: the more samples (rays), the smaller the filter size. Color bleeding is a term that is used to describe the effect of a red carpet next to a white wall giving a pink tint to the wall. Color bleeding is a diffuse-to-diffuse effect. In this section we will only look at how to compute a single bounce of diffuse-to-diffuse reflection. In the following sections, we will consider multiple bounces. The indirectdiffuse() function contains a gather loop plus some time-saving shortcuts described below. P is the point where the indirect diffuse illumination should be computed. N is the normalized surface normal at P. The "samples" parameter specifies how many rays should be shot to sample the hemisphere above point P. As with the gather loop mentioned above, "samples" is a quality-knob: more samples give less noise but take longer. Again, any value of "samples" can be used, but values of 4 times a square number (ie. 4, 16, 36, 64, 100, 144, 196, 256...) are particularly cost-efficient. An optional "environmentmap" can be used to look up an environment color when a ray does not hit any object. When a ray hits an object the surface shader of that object is evaluated. The following RIB file uses indirectlight to add diffuse-to-diffuse light to the matte shader. The sphere and box have constant, bright colors, and those colors "bleed" onto the diffuse ground plane. The resulting image (below, left) is very noisy, since "samples" was set to only 16. In the image on the right, "samples" was set to 256. Shooting 256 rays from every single shading point is very time-consuming. Fortunately, diffuse-to-diffuse effects such as color bleeding usually have slow variation. We can therefore determine the diffuse-to-diffuse illumination at sparsely distributed locations and then simply interpolate between these values, typically providing speedups of a factor of 10 or more. Illumination can be safely interpolated at shading points where the illumination changes slowly and consistently. The tolerance is specified by the "maxvariation" parameter, just as for the occlusion() function (see above). Low values of "maxvariation" give higher precision but make rendering take longer. Setting "maxvariation" too high can result in splotchy low-frequency artifacts where illumination is interpolated too far. This image is indistinguishable from the one above, and was computed much faster. Below we see two images of the box. On the left, the box has only direct illumination (the line 'LightSource "indirectlight" 2 ...' has been commented out). On the right, the box has direct illumination and one-bounce indirect illumination. For historical reasons, this type of illumination computation is sometimes called final gathering only. 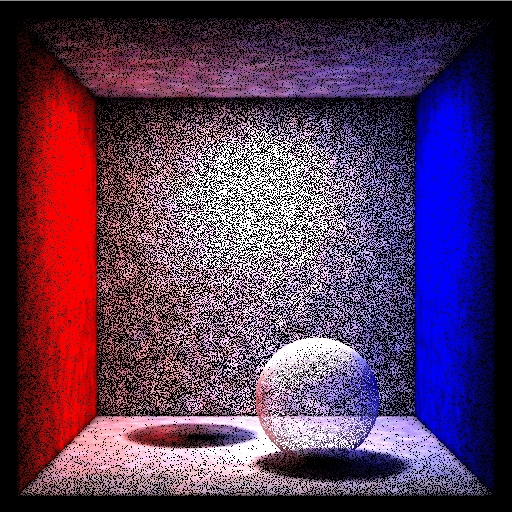 Changing the "maxvariation" parameter to a value larger than 0 enables interpolation of the indirect illumination. This can speed up the rendering significantly. Values for "maxvariation" in the range 0.01 to 0.02 are typical. Larger values speed up rendering but can result in splotchy artifacts. The interpolation can only work if it gets reliable indirect illumination values at those positions where it deems it necessary to shoot rays. If the number of rays is too low, there will be too much noise in the ray-traced results, and any attempt at interpolating between those noisy values is bound to fail. As a rule of thumb, 1/"samples" should be smaller than "maxvariation". (In addition, the optional "occlusionhitsides" parameter should be left at its default value "both" for the interpolation to work.) As of PRMan 16.0, when "maxvariation" is larger than 0, PRMan will print a warning if the number of samples is too low for the given "maxvariation" or if "occlusionhitsides" isn't "both". Another optimization is adaptive sampling of the hemisphere. As with adaptive sampling in occlusion(), this is turned on by default if the number of samples is at least 64. If you want to turn it off, set the optional parameter "adaptive" to 0. If "adaptive" is on and the optional parameter "minsamples" is supplied, the hemisphere will be adaptively sampled with at least "minsamples" (if "minsamples" is not supplied, "samples"/4 will be used). It is not recommended to set "minsamples" to less than one quarter of "samples". Adaptive sampling gives good speedups if the scene contains large bright and dark regions. If the scene contains a lot of small details (for example: small objects, small shadows, or high-frequency textures), adaptive sampling does not give any significant speedup. Light paths from the light source through specular reflection(s) to diffuse reflection is classified as a caustic path and is better computed with photon mapping. With the radiosity cache introduced in PRMan 16.0 the computed colors are reused for other ray directions, so the colors must be view-independent. For performance, it is important that the surface shaders (at the objects the diffuse rays hit) are as efficient as possible. 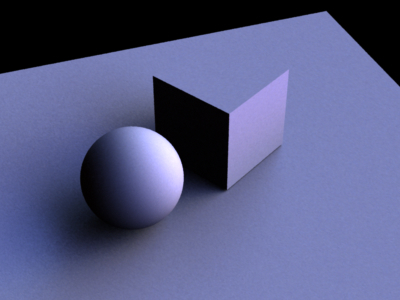 It is often possible to simplify the surface shader computation considerably for diffuse ray hits. 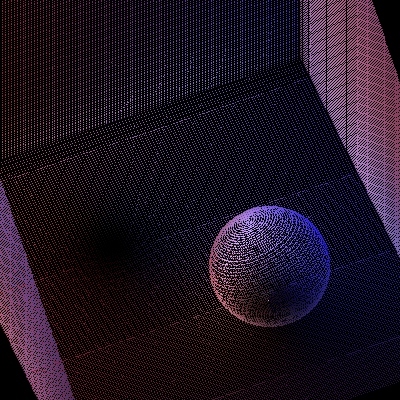 For example, one can often reduce the number of texture map lookups, reduce the accuracy of procedurally computed values, et cetera. So, when using a shader in a scene with color bleeding computations it is good shader programming style to check if the ray type is diffuse (or, in general, if "diffusedepth" is greater than 0), and to skip view-dependent calculations and use simpler, approximate computations wherever possible, and only one shadow ray for ray-traced shadows. The ray type can be checked with a call of rayinfo("type", type) and the diffuse ray depth can be found with a call of rayinfo("diffusedepth", ddepth). If these rules are followed, computing color bleeding can be almost as fast as computing ambient occlusion - well, at least within a factor of two. It is also possible to entirely avoid evaluating the surface shader at the diffuse ray hit points. The indirectdiffuse() function has an optional parameter called "hitmode" (similar to occlusion()'s "hitmode" parameter), that can have four possible values: "default", "primitive", "cache", and "shader". If "hitmode" is set to "primitive", the object's Cs and Os vertex variables are interpolated and used instead of running the shader. If the object has no Cs vertex variables, the object's Color attribute is used instead, and similar for Os and Opacity. If "hitmode" is set to "cache", the color and opacity is determined by looking up in a point cloud or brick map (determined by Attribute "shade" "diffusehitcache" "file:foobar.ptc"). If "hitmode" is "shader", the surface shader will be evaluated at the hit points. If "hitmode" is "default" then an attribute at the hit object decides: Attribute "shade" "diffusehitmode" can be "primitive", "cache", or "shader". The figure below shows two examples of the use of the "hitmode" parameter with indirectdiffuse(). The scene consists of a ground plane and square polygon floating above it. The square has a constant shader that returns Cs. 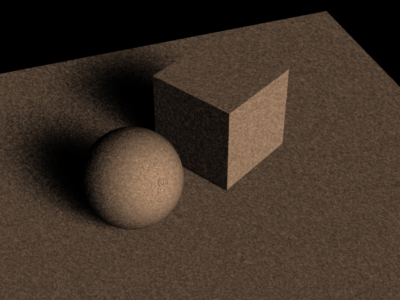 The shader on the white ground plane computes indirect diffuse. The indirectdiffuse() parameter "hitmode" is set to "primitive". In the image to the left, the square has no Cs vertex variables, and the Color attribute (which is green) is used. In the image to the right, the square has Cs vertex variables corresponding to black, red, green, and yellow. For this particular scene, this gives the same result as if the "hitmode" was "shader", but faster. In the previous section, only one bounce of indirect diffuse light was computed. To get multiple bounces, set the trace "maxdiffusedepth" to 2 - Attribute "trace" "int maxdiffusedepth"  - or 3, or whatever the required number of bounces is. In PRMan versions before 16, this would take a very long time to render, but with the introduction of the radiosity cache, the render time is much more reasonable. As a further optimization, it pays off to reduce the number of rays shot for diffuse depths greater than 0. An example of this is shown in the paintedplasticGI shader presented above. With this optimization, computing two bounces typically only increases render time by around 10-20%. Computing three bounces adds another 10-20%, and so on. 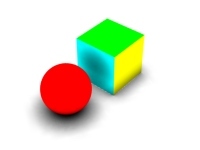 The images below show 0, 1, 2, and 3 bounces of color bleeding with the paintedplasticGI shader. The images were rendered with 800x800 pixels on an 8-core machine. An alternative way of getting multiple bounces is using photon maps. With the photon map method we get multiple bounces essentially for free, since they are precomputed in the photon map; only the last bounce to the eye is expensive (as above). Furthermore, it is often the case that rendering using lookups in a global photon map is faster than computing color bleeding without the photon map. This is because the photon map lookups save us the time spent evaluating the (possibly ray-traced) shadows at the ray hit points. Generating the global photon map is very similar to the generation of a caustic photon map (described in the separate application note Caustics in PRMan). A photon map is a special kind of point cloud file (the data at each point are photon power, photon incident direction, and now also the diffuse surface color) and can be displayed with the interactive point cloud display application ptviewer. ptviewer can display photon maps (and other point clouds files) in three modes: points, normals, or disks. ptviewer is very useful for navigating around the photon map (rotate, zoom, etc.) to gain a better understanding of the photon distribution. Note that the color of each photon is the color it has as it hits the surface, i.e. before surface reflection can change its color. Also note that photons are only deposited on diffuse surfaces; there are no photons on the chrome sphere. Here filename is the name of the brick map file, P is the position at which to estimate the global illumination, N is the normalized surface normal at P, and irrad is the variable that the texture lookup result is assigned to. Note that this photon map lookup gives a (rough) estimate of the total illumination at each point, so it would be wrong to add direct illumination using, for example, an illuminance loop or the diffuse function. Unfortunately, images rendered in this way have too much noise. Global photon maps simply have too much low frequency noise in them to be acceptable for direct rendering. Two examples are shown below. They use 50 and 500 photons (the -nphotons parameter to ptfilter) to estimate the illumination, respectively. As these images show, increasing the number of photons used to estimate the indirect illumination decreases the noise but also blurs the illumination. In order to get crisp, noise-free images, an extraordinarily large number of photons would have to be stored in the photon map. This is not viable with current technology. Instead, we have to use the indirectdiffuse() function again - similar to the previous sections. The difference is that the shader now has to look up the irradiance (with a texture3d call) if the max diffuse ray depth (usually 1) has been reached. Below we see two images of the box. On the left, the box has only direct illumination and one bounce of indirect illumination. 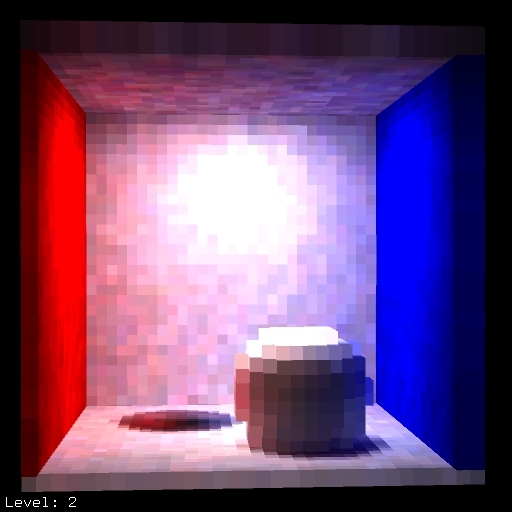 On the right, the box has a full global illumination solution. Again, changing the "maxvariation" parameter to a value larger than 0 enables interpolation of the indirect illumination. This will typically speed up the rendering significantly. Note that, since photon maps are generated in a separate pass, the scene used for photon map generation can be different from the rendered scene. This gives a lot of possibilities to "cheat" and alter the indirect illumination. 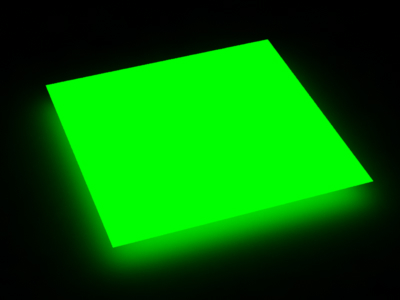 Also, the indirect illumination computed using the photon map can be used just as a basis for the rendering - nothing prevents us from adding more direct lights for localized effects, cranking the color bleeding up or down, et cetera. Sampling the hemisphere above a point is a very expensive operation, since it involves tracing many rays, potentially many shader evaluations, et cetera. To save time, we interpolate ambient occlusion and soft indirect illumination between shading points whenever possible, rather than sampling the hemisphere. To save more time, we can also reuse computed occlusion and indirect illumination from one frame to the next in animations. This is often referred to as baking the occlusion and indirect illumination. If the occlusion or indirect illumination doesn't change significantly on some objects during an animation, we can precompute the occlusion and indirect illumination on these objects once and for all, and use those values in all frames. Precomputing and reusing computed data in multiple renderings or multiple frames is useful to speed up ambient occlusion and indirect illumination (environment illumination, color bleeding, and photon map global illumination). We call such data files occlusion point cloud files or irradiance point cloud files, depending on which data they contain. There are no restrictions on the naming of these files. One convenient convention is to use the suffix ".ptc" for point cloud files. Point cloud files can be generated by the bake3d() function and can be read by the texture3d() function. It is recommended to turn off culling of hidden surfaces. This is to ensure that occlusion/irradiance is computed even on surfaces that are hidden behind other objects for the current viewpoint. This is done with Attribute "cull" "hidden" 0. If the baked data are to be used for other viewpoints of the visible objects, and objects have "Sides 1", turning off backface culling is recommended. Otherwise, the back sides will not be shaded, and no occlusion/irradiance values will be computed there. This is done with Attribute "cull" "backfacing" 0. To ensure an even distribution of irradiance data, turn view-dependent dicing off. This is done with Attribute "dice" "rasterorient" 0. If the baked data are to be used for other viewpoints, bringing parts that were previously outside the viewing frustum into view, the camera needs to be moved such that those parts of the scene are also visible during baking. Trying to interpolate occlusion/irradiance data from locations where the file does not have any information will give incorrect values (no occlusion and black irradiance). During the generation of the point cloud, values are written out for each shading point, so the density of the point cloud data is determined by the image resolution and shading rate. Be careful about which direction the normals face when generating the occlusion and irradiance data. If the normals face opposite when baking vs. lookup, no data will be found. Also, if the normals are unintentionally pointing inside closed objects (either because the object was modeled that way or because faceforward() was called), full occlusion will be computed. If the objects have displacements, make sure to turn on the "trace" "displacements" option. This is necessary since the occlusion is computed using ray tracing. Also see the section on common pitfalls and known issues in the Baking 3D Textures application note; note that the issues discussed here also apply for brick maps. The interactive application ptviewer is helpful for navigating (rotate, zoom, etc.) around the point cloud data to gain a better understanding of the distribution and values of the occlusion and irradiance data. The following is a simple RIB file for generating three occlusion point cloud files: wall.ptc, floor.ptc, and hero.ptc. Surface "bake_occ" "filename" "wall.ptc" "displaychannels" "occlusion"
Surface "bake_occ" "filename" "floor.ptc" "displaychannels" "occlusion"
Translate -0.3 -1 0   # this is the local coord sys of the "hero"
Surface "bake_occ" "filename" "hero.ptc" "displaychannels" "_occlusion"
Running this RIB file produces the image and three point cloud files shown below. Note that the images show the occlusion (white meaning full occlusion, black meaning no occlusion) while the image is rendered using 1 minus occlusion. Next, we want to reuse as much of these occlusion data as possible in an animation where the camera moves and the "hero character" (the cylinder with a sphere on top of it) moves to the right. The back wall is static and the "true" occlusion changes so little that we can reuse the occlusion baked in wall.ocf. The "hero" moves perpendicular to the wall and ground plane, and deforms a bit. His occlusion (in hero.ocf) can also be reused without introducing too much of an error. It is only the floor's occlusion that cannot be reused: moving the hero changes the occlusion on the floor too much - reusing the baked occlusion would leave a black occluded spot on the ground at the place where the hero initially was. 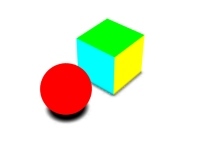 The read_occ shader can be used if the objects undergo rigid transformations. For deforming objects, it is simple to write a similar shader (called read_occ_Pref) that reads the occlusion values at reference points. The only difference from the previous shader is that Prefs are passed in as a shader parameter (varying point Pref = (0,0,0)) and Pref is used instead of P in the texture3d() lookup. 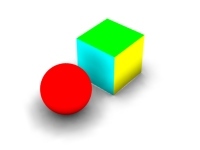 The read_occ_Pref shader is useful for reusing occlusion values on deforming objects with reference points. Here is the RIB file for the same scene with the camera moved and the hero character moved and deformed. Surface "bake_occ" "filename" "floor.ptc" "displaychannels" "_occlusion"
The RIB file nurbscylinder_deformed contains a deformed NURBS cylinder with Pref points corresponding to the undeformed NURBS cylinder. Running this RIB file produces the image below much faster than if the occlusion values weren't reused. When baking ambient occlusion, it often pays off to not bake points with full occlusion. If a point is fully occluded, we will never get to see it, no matter what the camera point and direction are. This reduces the size of the point cloud file, and can also help avoid problems on very thin walls where the inside is fully occluded but the outside is not. Consider again the scene with the "hero" character in a room. We'll now replace the shaders in the example above with shaders that bake and reuse irradiance instead of occlusion. We'll also add a large bright green patch to the scene. All other surfaces are white. Here is the RIB file for generating three point cloud files with irradiance data: wall.ptc, floor.ptc, and hero.ptc. The images below are the rendered image along with the three generated point cloud files. Finally we are ready to reuse the baked irradiance values. Here is a shader that calls the texture3d() function. It is simple to write a similar shader using Pref points (for the deformed cylinder). The following is the scene description for re-rendering the scene from a different camera viewpoint and with the "hero" moved away from the bright green patch. We reuse the baked irradiance on the wall and "hero" but cannot reuse the irradiance on the floor since the dark spot would be in the wrong place. Note that the green irradiance on the "hero" is actually too bright and wraps around the cylinder and sphere too far, since he is now much further away from the bright green patch than when the irradiance was computed. It is a matter of judgment whether this is acceptable. A simple adjustment is to decrease the weight of the irradiance on the "hero". The amount that the green illumination wraps around the cylinder and sphere would still be wrong, but that may be less objectionable than the incorrect brightness. If we want to render an animation where the camera flies over a scene or zooms in or out, we need different densities of occlusion/irradiance data in different parts of the scene. This can be accomplished by generating point cloud files for a few key frames, and then creating a single brick map from all of the point cloud files (using brickmake). Here is an example of three occlusion files computed for three different camera positions in a dragon scene. In the combined file, the occlusion data are dense where they need to be, and sparse elsewhere. An entire animation can be rendered with this combined occlusion brick map. Rendering the frames is fast, since no new occlusion is computed; it is just looked up in the brick map file. The same approach can be used for baking irradiance for a fly-through. Point cloud files can be quite big. However, gzip compression works really well on these files: the file sizes are typically reduced by 75-90%. prman, brickmake, and ptviewer can read gzipped files directly. Q: Which global illumination method do you recommend? A: We used to recommend using multi-pass methods such as baking the direct illumination or photon mapping. But with the multiresolution radiosity cache introduced in PRMan 16.0 it is just as efficient, and much easier, to just increase the max diffuse depth as described above. Q: The ambient occlusion (or indirect diffuse illumination) looks splotchy. What parameters can I change to make this go away? Q: I'm computing ambient occlusion (or indirect diffuse illumination) on a displaced surface. The ambient occlusion (or indirect diffuse illumination) looks really strange and splotchy. Is there something I need to do? Q: My point cloud files are really huge. Is there any way to make them smaller? A: Gzip compression works really well on these files; the file sizes are typically reduced by 75-90%. prman, brickmake, and ptviewer can read gzipped files directly. Q: When rendering baked ambient occlusion or indirect diffuse illumination using texture3d(), are the attributes "irradiance" "maxerror" and "irradiance" "maxpixeldist" used for anything? A: No. Since all occlusion and indirect diffuse information is read from the brick map file, maxerror and maxpixeldist are ignored. Q: What is the difference between a caustic photon map and a global photon map? A: The caustic photon map only contains photons that hit a diffuse surface coming from a specular surface. The global photon map contains all photons that hit a diffuse surface (no matter where they came from). So if both maps are generated at the same time for a given scene, the photons in the caustic photon map are a subset of the photons in the global photon map. Q: I'm using a global photon map, but my picture shows no indirect illumination. Why? A: First check that the global photon map has the right name and actually has photons in it. Inspect the photon map with sho or ptviewer. Also make sure that the surfaces where the indirect illumination should come from have a globalmap attribute. Note that photons from point and spot lights inherently have a square falloff. So if the lights you use for direct illumination have linear or no falloff, the indirect illumination can be very dim compared to the direct illumination. In SIGGRAPH 2002 Course Note 16, pages 87-102. Realistic Image Synthesis using Photon Mapping. Henrik Wann Jensen, Frank Suykens, Per Christensen, and Toshi Kato. 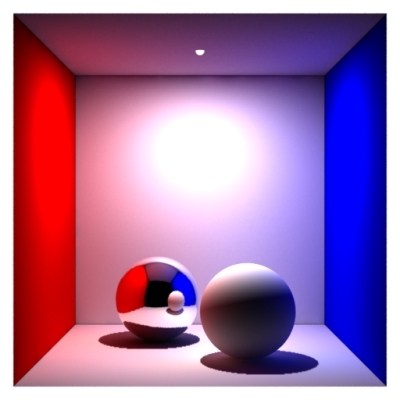 A Practical Guide to Global Illumination using Photon Mapping. SIGGRAPH 2002 Course Note 43. Per Christensen and Dana Batali. Information about PRMan's ray tracing functionality can be found in the Ray-Traced Shading application note. 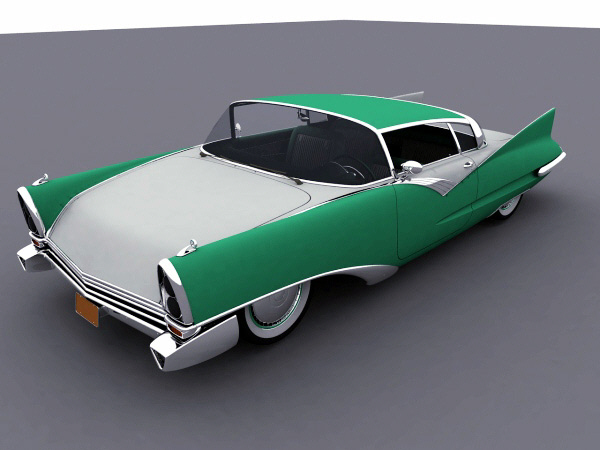 More details about PRMan's 3D baking approach can be found in the Baking 3D Textures application note. PRMan's caustic rendering (which also uses the photon map method) is described in the Caustics application note. Photon tracing can not be done in parallel at this time. Photon tracing can not be done using netrender at this time.